Splenosis is implantation of the splenic tissue in the abdominal region or elsewhere in the body as a consequence of trauma or splenectomy, which might mimic intra-abdominal involvement of several malignancies. 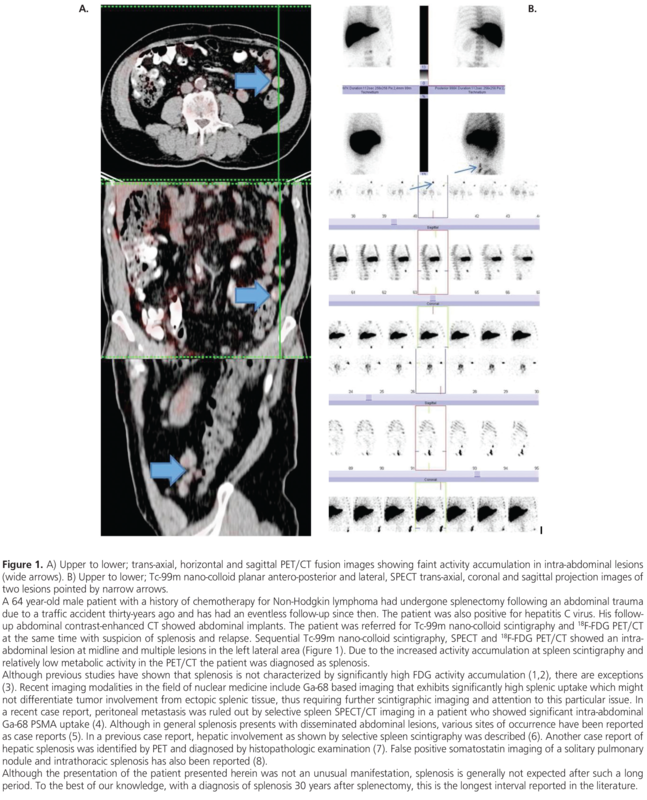 This case report presents a patient with abdominal implants without 18F-FDG accumulation confirmed to be splenosis by Tc-99m nano-coloid scintigraphy. Surgical and Medical Practices: Z.P.K., P.Ö.K., A.T., Concept: Z.P.K., P.Ö.K., Design: Z.P.K., P.Ö.K., Data Collection or Processing: Z.P.K., P.Ö.K., A.T., Analysis or Interpretation: Z.P.K., P.Ö.K., A.T., Literature Search: Z.P.K., P.Ö.K., Writing: Z.P.K., P.Ö.K. Martínez Lorca A, Coronado Poggio M, Hernández Pérez I, Ramírez Escalante Y, Rizkallal Monzon S, Marín Ferrer MD. [Utility of (99m)Tc-labelled heat-denatured erythrocyte scintigraphy and 18F-FDG PET-CT to differentiate accessory spleens from tumoral metastases. A case report]. Rev Esp Med Nucl Imagen Mol 2015;34:68-69. Ake AC, Menzli A, Lecomte JC, Mampassi-Makaya A, Valleix D. Peritoneal splenosis mimicking peritoneal carcinomatosis: a case report. Diagn Interv Imaging 2012;93:890-893. Kellert B, Caster M, Des Jean R, Vaccarello L. Diffuse intra-abdominal splenosis presenting as carcinomatosis exhibiting positron emitted tomography hypermetabolic activity. Gynecol Oncol Case Rep 2013;5:46-48. Demirci E, Has Simsek D, Kabasakal L, Mülazimoğlu M. Abdominal Splenosis Mimicking Peritoneal Metastasis in Prostate-Specific Membrane Antigen PET/CT, Confirmed With Selective Spleen SPECT/CT. Clin Nucl Med 2017;42:e504-e505. Treglia G, Giovanella L, Muoio B, Caldarella C. Splenosis Mimicking Relapse of a Neuroendocrine Tumor at Gallium-68-DOTATOC PET/CT. Nucl Med Mol Imaging 2014;48:163-165. Kok J, Lin M, Lin P, Ngu C, Sam S, Loh C, Kociuba K. Splenosis presenting as multiple intra-abdominal masses mimicking malignancy. ANZ J Surg 2008;78:406-407. Krawczyk M, Schneider G, Farmakis G, Zimmer V, Lammert F. Splenosis mimicking hepatic adenoma. J Clin Exp Hepatol 2013;3:351-352. Leong CW, Menon T, Rao S. Post-traumatic intrahepatic splenosis mimicking a neuroendocrine tumour. BMJ Case Rep 2013;2013.